Easy Accessibility & Navigation: WordPress is a popular, free to install and easy-to-use platform, making the website building process very accessible for beginners. Users can easily navigate through the pages and content. Even if you get stuck, there are tons of WordPress forums and experts that can help you. Contact the Computer Geek for expert assistance on any WordPress issues you might have. Plugins: WordPress has a large variety of free/cheap plugins that users can install to customize and improve their websites. Types of plugins include: caching, subscription options, SEO, analytics, social media integration, and more. Often times, these plugins can be very useful and simple to use. Themes: WordPress carries many free and reasonably priced themes for users to install. This allows users to customize the look and aesthetic of their site without the need for extensive knowledge in HTML and website building. Many WordPress themes are created to be mobile-friendly, allowing website owners to reach a huge portion of the population with phones, tablets, and other electronic devices. Complete Control: Through using the WordPress platform, you are given complete control over your website in terms of customization, ownership over files and data, as well as the ability to move your site to other platforms. There are a lot of WordPress experts available to assist if required. In short, anyone can easily and cheaply create a website without a lot of cost or effort. Website Maintenance: While it is definitely an advantage to have complete control over your website, more time is required in maintaining your website. This includes tasks, such as installing updates, making backups, and ensuring that your website is safe and secure. Lots of Updates: While it may only take a few clicks of a button, be prepared to install a few updates per month in order to ensure everything is working properly on your WordPress website. Custom themes: While many WordPress themes allow you to customize and change the layout to a certain degree, knowledge of coding and website building is needed to make more advanced changes. Easy to Hack: WordPress is considered to be one of the easier website building programs to hack, which is why it is important to install malware software onto your website, as well as keep up with your updates. Website May Operate Slow: WordPress requires a lot of overhead to keep a site running, which is why your website may slow down if you pile too much onto it. Ensure to invest in good hosting, install a caching plugin, delete unused plugins and shrink your photos to keep your site running quickly and efficiently. Read our article "How to Speed Up Your WordPress Website?" for more information. Ultimately, WordPress is an accessible and easy to use platform for beginners, giving users complete control over their websites, as well as equipping them with useful plugins/themes that can be used to site customization. On the other hand, WordPress sites require a lot of maintenance to ensure that your website is secure, as well as operating quickly and efficiently. What are the Pros and Cons of Creating a WordPress Website? | Computer Geek 5 out of 5 based on 103 user ratings. 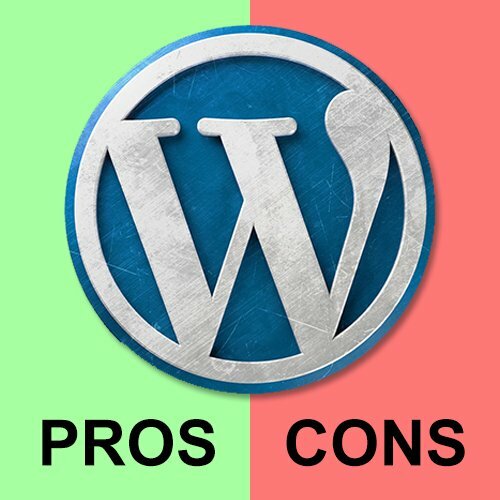 What are the Pros and Cons of Creating a WordPress Website? - WordPress Pros Easy Accessibility & Navigation: WordPress is a popular, free to install an . . .